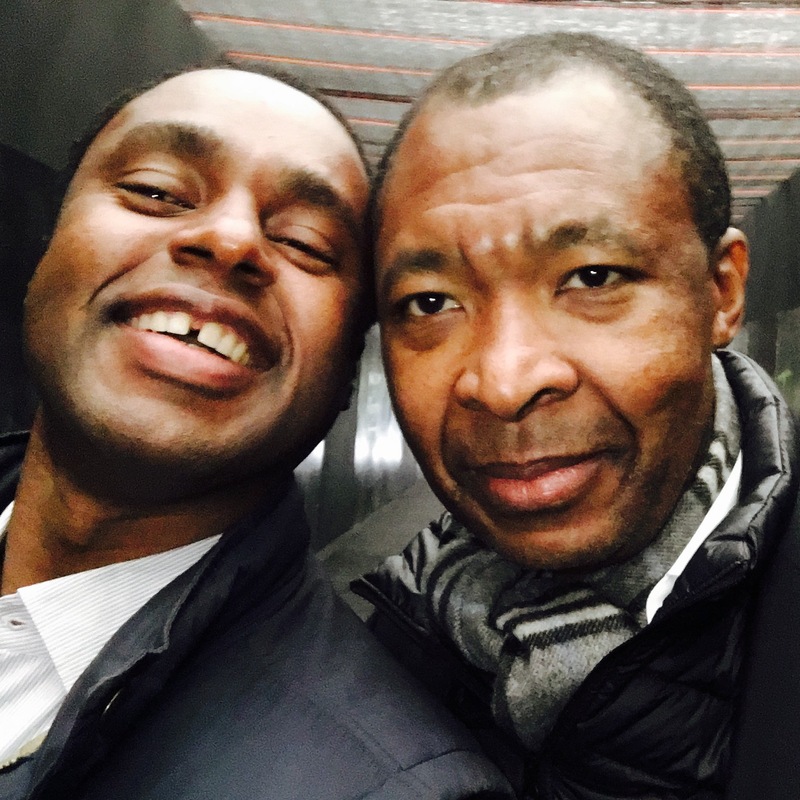 Upon hearing, early on March 15th, that Okwui Enwezor had died at age 55 in Munich, where he was being treated for cancer, I reminisced about specific moments in our 30-year friendship, and the many ways in which he’d supported and encouraged me in my career and life choices, starting with those early days of mentorship in New York, when I was a teenager visiting the city and trying to figure out a future for my young self. That reminiscing came after moments of longing in anxiety and sadness. In the hours before he died, I had been alerted, by our mutual friend, the German curator and educator Ute Meta Bauer, that Okwui’s days were numbered, so I attempted (and failed) to reach him one last time via email. Over the three decades I knew him and called him my big brother, Okwui had risen to become one of the world’s foremost curators, taking on some of the art world’s biggest shows, including the 2002 edition of documenta, a prestigious exhibition that is held every five years in Kassel, Germany, and the 2015 Venice Biennale. I attended both of those shows, in the way that I attended most of his other shows, as an observer and as a sounding board, because I knew that Okwui always wanted from me more than a little bit of constructive (and sometimes harsh) criticism. I told him it was tough love, and that I expected the same from him when it came to my own work. I had met Okwui in New York City in 1988, through my Togolese friend Lionel Teko. I remember our first conversation, when I told Okwui that I’d just received my baccalauréat in Paris, and that I was wondering where to go for college, and what to study. He replied that even though I was only 17 I should write, in order to comment on what was going on around me. Even though we were both interested in subcultures and creative movements coming from every continent, my 30-year dialog with Okwui was mostly about art and culture originating in Africa and the African diaspora. We both loved—and wrote extensively about—the Malian photographer Seydou Keïta, whom he’d included in his seminal 1996 Guggenheim exhibition “In/Sight: African photographers, 1940 to the Present.” We both complained to each other about the lack of airlines operating in Africa, and how difficult it was to move between African capitals. His perspectives on art history were often informed by detailed analyses of the economic trends, sociological factors and political confrontations that led certain artists to make certain choices. When he got into teacher mode, which would happen often when we were together, he would take pleasure in schooling me on specific artists, particularly who was learning from whom, who was copying whom, and who had influenced whom. Comparing my childhood notes from Lomé, Togo, with his tales from Enugu, Nigeria, we discussed art and artists, but also activism and activists, politics and politicians, and the need for trans-border African integration. (After the collapse of Air Afrique, we both felt that a great new African airline would be a start.) I later defined our dialog as a transcultural feedback loop, because it began as causal reasoning over the role of black people in Western societies before evolving over time into an exchange around our respective understandings and appreciations of hybrid identities from around the world. Like many, we were drawn to figures who were able to reimagine the world through artistic expression, especially when those figures saw the need for “change.” In 2002, on the occasion of the PS1 presentation of his landmark show “The Short Century: Independence and Liberation Movements in Africa, 1945-1994,” which he had originally curated for the Museum Villa Stuck in Munich, I interviewed him for the art issue of Trace. (The article was published again two years later, in my book Transculturalism: How the World is Coming Together, under the headline “Gradual Change.”) As a descendant of influential Togolese politicians who’s been directly involved in Togo’s struggle for independence, I initially felt that some of the post-colonial lines connecting artistic creation and freedom fighting might be difficult to trace across continental divides. Okwui argued that politics was at the root of much of Africa’s artistic output in both pre- and post-independence days. Ten years later, in April 2012, we found ourselves in Paris at the same time. It was a sunny spring day, and we agreed to meet at a café we both liked, Le Grand Corona, located right on the Place de l’Alma, the scene of Princess Diana and her companion Dodi Fayed’s fatal car crash. I knew Okwui was pressed for time, because I was also aware of the fact that, in less than 48 hours, he would be opening “La Triennale 2012: Intense Proximité,” his latest monumental show at the newly expanded Palais de Tokyo. Still, I asked him to give me a sneak preview of the exhibition and space, all 22,000 square meters of it. After all, that’s what big brothers do. This was a major theme in our ongoing conversations, the tensions that come with the feeling of always being outsiders. Outsiders because our nomadic lives had been shaped by our desire to immigrate to America, and in turn to work all over the globe. As we began praising the recent work produced by the Moroccan artist Yto Barrada, one of more than 100 artists Okwui and his team had chosen for “La Triennale,” I asked him to give me a bit of context on what he’d written concerning mobility and migration. Soon enough, we started talking, again, about the plight of refugees and immigrants in Europe, and in America. He told me that he had no faith in most of the rising European politicians, because it was getting much easier for them to get elected by riding the populist, anti-immigration wave. That Paris conversation about migration and mobility at Palais de Tokyo brought me back to a dinner we’d had four years earlier, at a restaurant in Brooklyn’s Fort Greene neighborhood where he was living at the time. Throughout dinner, Okwui couldn’t stop talking about his plans to launch a new publication, called Chronotope. I didn’t know what a chronotope was, so I googled it and found that it is “a concept used in literary theory and philosophy of language to describe how configurations of time and space are represented in language and discourse.” Over dinner in Brooklyn, I didn’t really know where he was going with all that, but in Paris I understood that nearly all of Okwui’s curation and writing was located right on the axis of symmetry where time meets space. He crisscrossed the globe searching for new ideas and new talent, all while researching the past, because he didn’t want to run out of time. In October 2015, a few months after his Venice Biennale triumph, we met in London’s Regent Park, at the private view of the Frieze art fair. Okwui was never a big fan of art fairs. Zigzagging between that aisles and slowly navigating the galleries, there wasn’t a minute that went by before he was accosted by yet another dealer, artist, journalist, or collector. As I’d done at other fairs in the past, I positioned myself as a bit of a shield for him, protecting him from shallow conversation, superficial chit chat and senseless networking. That day at Frieze, I could tell that he wasn’t his usual self. I asked him what was wrong and he told me that his sister’s recent death was still weighing him down, that she lived in London and that they had been very close. I remember him saying something nasty about cancer as an illness.